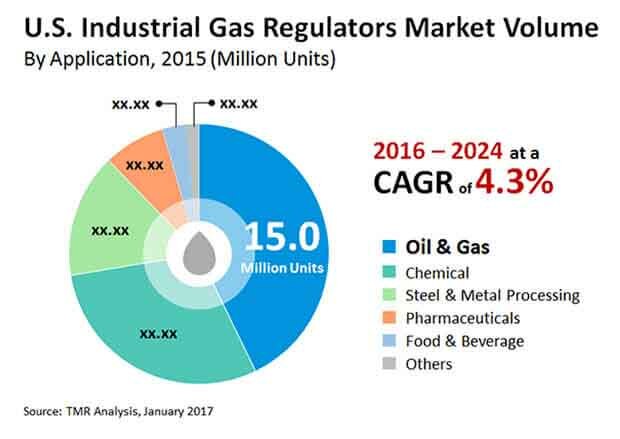 The U.S. industrial gas regulators market displays a highly fragmented competitive landscape, thanks to a great number of vendors operating in the market, states Transparency Market Research (TMR). According to the findings of TMR, the foremost three companies, Honeywell Process Solutions, Emerson Electric Co., and The Linde Group held a share of 58.6% in the U.S. industrial gas regulators market during 2015. These prominent players are likely to retain their dominant position in the market via their innovative business strategies. The findings of the report by TMR reveal that in 2015, the U.S. industrial gas regulators market was pegged at US$2.3 bn. Expanding gradually at a CAGR of 3% between 2016 and 2024, the market might reach US$3.0 bn by 2024 in terms of revenue. Based on type of gas, corrosive, inert, and toxic gases are the key segments of the U.S. industrial gas regulators market. Of these, the inert gas segment is likely to emerge at the fore, triggered by the popularity of the eco-friendly solution offered by natural gas. As a growing number of end users adopt inert gas to avoid undesirable chemical reactions during the manufacturing process, the demand for these gases is likely to go up. The inert gas segment is expected to earn a revenue worth US$1.8 bn by the end of the forecast period. Several end-use industries such as steel, food and beverage, metal processing, oil and gas, and chemicals use these gases. By application, the oil and gas segment is expected to lead the U.S. industrial gas regulators market, advancing at a CAGR of 3.1% during the forecast period. The demand from the oil and gas industry will exceed the demand from other application segments due to the greater necessity to achieve precise pressure control. Advancements in gas regulator technologies have been aiding the expansion of the U.S. industrial gas regulators market to a great extent. The towering demand for innovative gas regulators that feature superior performance and reliability is a key factor influencing the market’s trajectory. The enhancement in user safety, coupled with the reduction of redundant work, has been driving the demand for advanced gas regulators. The increasing deployment of natural gas is also considered to be a favorable trend benefitting the overall growth of the U.S. industrial gas regulators market. Also, as the use of industrial furnaces and boilers across the country escalates, industrial gas regulators might receive a significant boost. A number of industries such as refining, chemicals paper, manufacturing, and food have been installing boilers and furnaces, fuelling the U.S. industrial gas regulators market over the forthcoming period. The restrictions imposed by the existence of strict regulatory frameworks applicable to the manufacturing of industrial gas regulators might impede the growth of the market in this region. Moreover, as the fabrication process of gas regulators depends on the particular standards that vary across different industries, the market might face obstructed growth. However, the mounting demand from the automotive industry is likely to create additional growth opportunities.